Here at Central Wheel Components, we pride ourselves on being Europe's largest stockist of classic rims. We have been collecting data for over 120 years, and drill the rims in house. So if you can't find what you're looking for, get in touch! 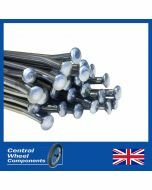 Here at CWC we have been collecting information on spoke lengths & drill patterns for over 120 years. The options above are not the full extent of our alloy rim options for AJS models. 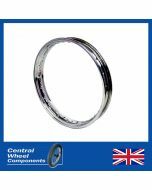 At CWC, we stock over 20,000 rims at any one time, so please get in contact with specific enquiries! The non-valanced rim offers a more hard-wearing profile. This is more commonly seen on off-road, competition, and normal road bikes. We also offer custom anodising, powdercaoting, and coachlining - get in touch for quotes & options.